Best Actress Oscar winner Jennifer Lawrence was left blushing when Jack Nicholson propositioned her at the Academy Awards. 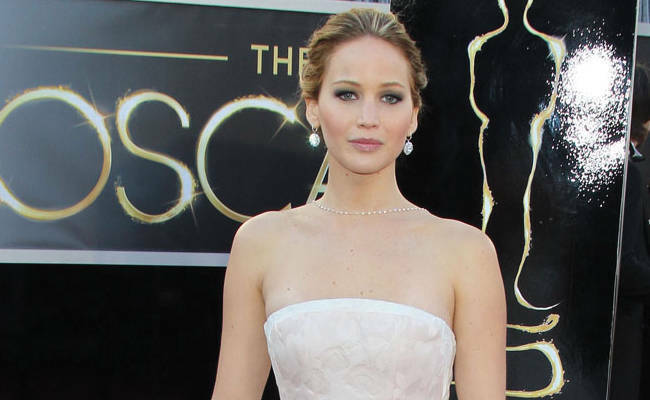 Jennifer Lawrence was shocked when Jack Nicholson hit on her following her Oscars win. The 22-year-old actress scooped the Best Actress award at the Academy Awards on Sunday (February 24, 2013) and was left blushing when Jack, 75, compared her to a former girlfriend and told her he would be "waiting" for her. During Jennifer's interview with Good Morning America, Jack interrupted and told her "You look like an old girlfriend of mine," to which she jokingly responded: "Oh really, do I look like a new girlfriend?" However, she was left uncomfortable when Jack replied: "I thought about it" before adding "I'll be waiting." It was an eventful night for Silver Linings Playbook star Jennifer who was previously nominated in the same category two years ago for her role in Winter's Bone as she received a standing ovation after she stumbled on the stairs leading up to the stage to collect her statue. Dressed in a stunning Dior Haute Couture gown, she said: "Thank you so much. This is nuts. "You guys are only standing up because I fell and you feel bad." The blonde beauty, who was accompanied at the ceremony by her parents, also thanked her co-stars, crew, and team for their support before wishing her fellow nominee, Amour star Emmanuelle Riva, a happy 86th birthday. Jennifer beat stiff competition from Jessica Chastain in Zero Dark Thirty, Quvenzhane Wallis in Beasts of the Southern Wild, Naomi Watts in The Impossible, and Emmanuelle.